In April 2003, Aron Ralston, a 28 year-old American hiker and adventurer, finds himself alone and in deep trouble. Even as he hikes through a part of the Grand Canyon, called the Blue John Canyon, Aron stumbles through a wedge, a rock topples, and crushes his right hand against a rock wall. Unable to budge the rock, and with no one of his family or friends informed of his whereabouts, Aron is on his own. Death seems inevitable even as five days pass, Aron makes occasional recordings on his digital camera for his potential finders and his parents. He passes in and out of hallucinations, recalls the past, and meanwhile, still tries to chip away at the rock, more at an attempt to keep warm. Finally, the desire to live swells in Aron to such an extent, he takes desperate measures. Achingly real, Danny Boyle's take on this astonishing tale of survival, is a mix of vertical, collage-like visuals, precise, humourous storytelling and one hell of a performance by James Franco. The critical scene,while horrifying, (A couple of them passed out at the screening) is still essential to convey Ralston's spirit. Decorated with apt music from various pop artists and a quality music score by A.R. 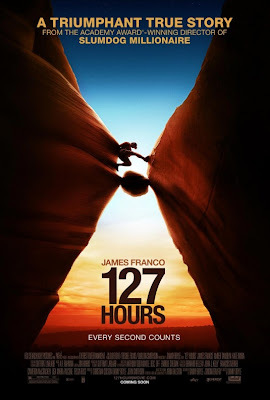 Rahman, 127 Hours is one roller coaster of a cinematic ride. Go for it.